The design plan for the ambitious 1,050 km Ganga Expressway has been completed and submitted to the Uttar Pradesh government. While industrialists and developers are eagerly waiting for the plan approval, geologists and environmentalists have sounded the warning bell the expressway planned alongside the river Ganga may not be sustainable and will ruin the fertile flood plain. The Ganga Expressway Project draws its inspiration from the Grand Trunk (gt) Road, one of South Asia's oldest and longest roads, which was built by Sher Shah Suri in the 16th century. The road was refurbished during colonial rule. 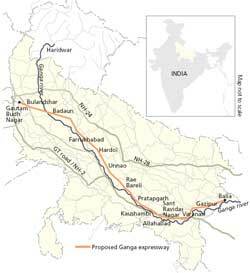 But unlike the gt Road, which runs along the right bank of the Ganga, the expressway, proposed by the Uttar Pradesh Expressway Industrial Development Authority, will be built on the left bank of the river.Geologists say this is the problem bank. "I wonder if the government pondered why the gt road was built on the right bank of the Ganga and not on the left," said V K Joshi, former director of the Geological Survey of India (northern region). There had been more floods on the left bank of the Ganga compared to its right bank, he said. Geologists link it to tectonic movement. The Indian plate is continuously sliding under the Tibetan plate. As a result the Ganga flood plain is sloping towards the convergence of the two plates, giving the left bank a greater incline, said Vibhuti Rai, a professor of geology in the Lucknow university. Subsurface analyses show that over the centuries, the Indian plate has sunk by 1,200 metres. Because of this subsidence, the river washes its right side and deposits silt on the left side, making it fertile, said Rai. This is known as the khadar region--the most fertile part of the Gangetic plain. The expressway will cut through this area. Estimates show 70 per cent of the 63,000 hectares (ha) that will go into the project are fertile farmland. The development authority claims the expressway will actually be built on marginal embankment proposed by the state irrigation department. But to allow the eight-lane expressway, the embankment will be made continuous and wide, up to 155 metres. This will fragment the flood plain. Environmentalists are not happy with the proposed em-bankment either. "The khadar region, being a low-lying area, acts as a buffer in case of floods. The planned structures will be barriers," said Himanshu Thakkar of South Asia Network on Dams, Rivers and People, Delhi. As per a study by scientists from iit Kanpur, each year the Ganga floods, it erodes 750 million tonnes of silt, of which 65 million tonnes get deposited in the flood plain. "Once the embankment comes up, the Ganga will gradually choke under the load of its own silt. We already see this in other rivers like Kosi," said Thakkar. Despite claims in the environment impact assessment (eia) report that there will be no change in the drainage pattern of rivulets in khadar, environmentalists fear the large-scale construction work will affect the recharge capacity of the region. There are also doubts about the project's environmental clearance process. Hardly any local resident participated in the public hearings held in 2007," said Pradeep Shukla of Vindhya Environmental Society, based in Mirzapur district. "We need roads for economic development but not at the cost of the Ganga," said Shukla. Joshi suggests building the expressway on the 'bangar' region--the less fertile part of the Ganga flood plain, farther from the bank. There is also scope for developing the National Highway 24 or the gt road. The government should check alternatives before it is too late.